The following is a generic order form that you can download as a Word Doc (.docx) or copy and edit as a Google Doc. 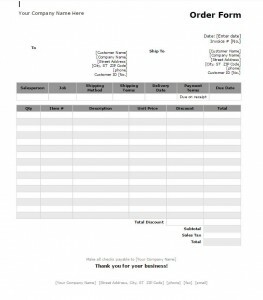 An order form is a way to help your business to look more professional. Often times I will see a new small business send “invoices” or order forms as simple “letters” rather than traditional order forms or invoice forms. Use the following to provide a more professional appearance for your business. If you are looking for something that would help with business record keeping and order form creation for clients in your database, consider free accounting software like Waveapps Accounting. If you require a different format, please let us know and we can create for you. Since this form requires so much specific detail from you a PDF and JPG version were not created.